Asteroids and comets are considered remnants from the giant cloud of gas and dust that condensed to create the sun, planets, and moons some 4.5 billion years ago. Create your own odd-shaped asteroids out of plain old mashed potatoes. Bake them in the oven to turn them (more or less) asteroid color. Then eat your asteroids for dinner! For the first time ever astronomers have studied an asteroid that has entered the Solar System from interstellar space. The object, dubbed Oumuamua, was spotted by several Earthly telescopes on Oct. 19, 2017. Try this asteroid mechanical explorer, made from three styrofoam meat trays. This project is a little bit hard, so you might want to ask a grown-up or big brother or sister to do it with you. An asteroid is a large rock in outer space. Some, like Ceres, can be very large, while others are as small as a grain of sand. Due to their smaller size, asteroids do not have enough gravity to pull themselves into the shape of a ball. Astronomers group asteroids into different categories based on the way they reflect sunlight. Comets are cosmic snowballs of frozen gases, rock and dust roughly the size of a small town. When a comet’s orbit brings it close to the sun, it heats up and spews dust and gases into a giant glowing head larger than most planets. The dust and gases form a tail that stretches away from the sun for millions of kilometers. Section of NASA site with additional pages about comets, too. A comet came perilously close to Mars on October 19, 2014. What we learned from that close encounter. Make a Comet Model and Eat It! Comets have sometimes been described as dirty snowballs, snowy dirtballs or something in between. But what does that really mean? It means that these they are believed to be a cold mixture of frozen water, dry ice (frozen carbon dioxide), and other sandy/rocky materials left over from the early formation of our solar system. In this activity, we are going to develop a comet model that you can eat. Note from the photograph below, that a comet is not necessarily round! Rosetta photographs comet as it draws near. The Rosetta orbiter will rendezvous with Comet 67P/Churyumov-Gerasimenko and remain in close proximity to the icy nucleus as it plunges towards the warmer inner reaches of the Sun’s domain. At the same time, a small lander will be released onto the surface of this mysterious cosmic iceberg. Rosetta arrives at comet destination August 3, 2014. This activity investigates the formation of craters. You’ll see how the size, angle, and speed of a meteorite’s impact affects the properties of craters. In addition, your family will become familiar with the terms meteor, meteoroid, and meteorite. A meteor shower is a spike in the number of meteors or “shooting stars” that streak through the night sky. Most meteor showers are spawned by comets. As a comet orbits the Sun it sheds an icy, dusty debris stream along its orbit. If Earth travels through this stream, we will see a meteor shower. What is unique about Richard Norton’s book is that it is both a field guide to observing meteors, and also a field guide to locating, preparing and analysing meteorites. 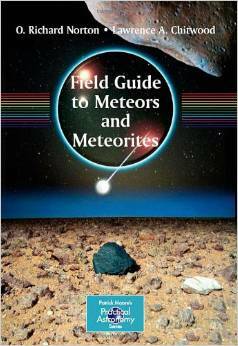 In addition to giving the reader information about observing techniques for meteors, this book also provides a fully detailed account of the types of meteorites, how and where to find them, how to prepare and analyse them. The book provides everything the amateur astronomer (or geologist!) needs to know about meteors and meteorites. It is thus the only complete book on the subject available at present.